Fifteen miles west of the city of Tucson, the Tucson Mountain region of Saguaro National Park is smaller, lower and biologically younger than the east section but the saguaros are just as large and extensive. 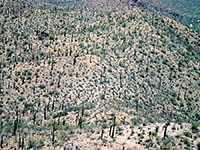 The north and west areas are generally flat with uninterrupted forests of the huge cacti, while the land becomes more mountainous towards the south and east, rising to a high point of 4,687 feet (Wasson Peak) where the saguaro are replaced by scattered bushes and sparse grassland, the temperatures are lower and the environment more moist. Since the park is crossed by several public highways, some areas can be seen without payment though the $10 entry fee (per vehicle) is required for any hiking or travel on unpaved roads. 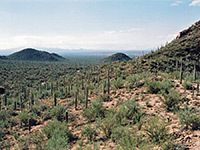 There is no campsite within the park, and backpacking is not permitted, so for overnight stays, options are either paid campsites in nearby towns, hotels in Marana and Tucson, or free camping on BLM land, such as beside the Manville Road entrance to Ironwood Forest National Monument, 10 miles to the west. Various roads and 40 miles of trails cross the park, mostly in the lower elevation areas, as much of the higher land to the east is accessible only by off-trail hiking. In the far north, the busy Picture Rocks Road links Tucson and I-10 with the scattered community of Avra, and passes through 3 miles of the park, while the dead straight Sandario Road cuts through the western edge for 5 miles and continues north to Marana. 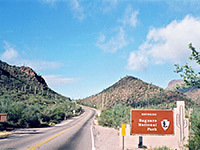 The Saguaro National Park visitor center at Red Hills is located along the narrower Kinney Road that crosses undulating land in the southwest corner, and also passes the short but very informative Desert Discovery Nature Trail, which descriptions of the main types of cacti and information about the local wildlife. To the south, this road encounters equally abundant saguaro in the adjacent Tucson Mountain Park, and links with an alternative route from the city through Gates Pass. The one backcountry drive in the park starts along Kinney Road - Hohokam Road (formerly known as Bajada Loop), an unpaved track, part of which is one-way, that leads deep into the cactus forest and links with Golden Gate Road, a connecting route from Picture Rocks Road. 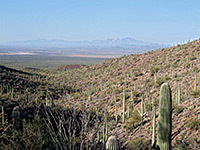 The best short path hereabouts is the Valley View Overlook Trail, which ends at an impressive viewpoint of rocky hills and saguaro-covered plains extending far beyond the park boundary, across Avra Valley to the distant Waterman Mountains, part of Ironwood Forest National Monument. Another popular path is the Signal Hill Trail. 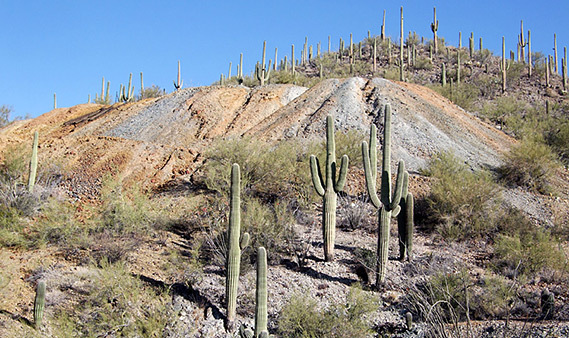 Longer hiking routes include the Hugh Norris Trail - also starting along the scenic drive, this heads into the Tucson Mountains well away from paved roads and so allows for a more peaceful and undisturbed experience of the Sonoran Desert. In general, climbing in to the hills is the best way to appreciate the park, to observe the changes in environment and take advantage of the better views; otherwise, the scenery seen just by driving along the roads is little-changing. 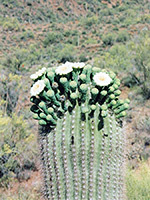 Around 30 cactus species grow in the vicinity of the Tucson Mountains including various types of opuntia, echinocereus, ferocactus and mammillaria. Apart from the saguaro, the most plentiful species are the cholla, with seven different species found - teddy bear, buckhorn, staghorn, pencil, christmas, cane and chainfruit. 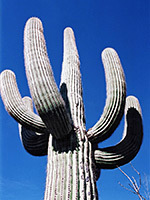 Most cacti, including the saguaro, are in bloom from April to June, with late May the best time. Along Kinney Road a few miles south of the park, the excellent Arizona-Sonora Desert Museum has a comprehensive collection of flora and fauna of the Southwest, including of course plenty of saguaros.